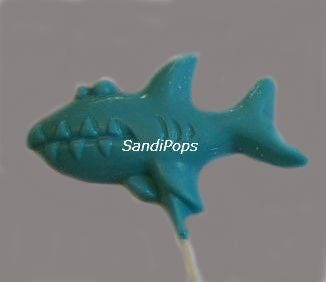 These delicious chocolate lollipops are made-to-order and will make a perfect addition to you shark / sea creature / under the sea themed party/event/pool party. They are also cute decor and cake toppers chasing sweedish fish! 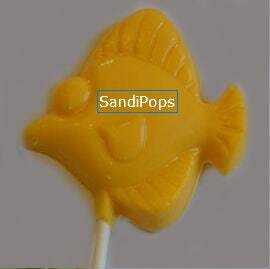 This listing is for 24 assorted sea creature lollipops, 5 blue sharks, 5 yellow fish, 5 pink sea horses, 5 green turtle, and 5 orange star fish. 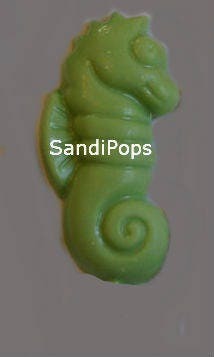 Each lollipop is individually wrapped in a bag and tied with a curled ribbon -PLEASE specify ribbon color or you will get a color that I feel corresponds to the pop colors. I can certainly make any number of pops you need and any colors you want, convo me for pricing.